With the nation at war in the 1940s, twenty-two-year-old Jack Valenti flew fifty-one combat missions as the pilot of a B-25 attack bomber with the 12th Air Force based in Italy. In the 1960s, with the nation reeling from the assassination of a beloved president and becoming embroiled in a far different kind of war in Vietnam, he was in that fateful Dallas motorcade in 1963, flew back to Washington with the new president, and for three years worked in the inner circle of the White House as special assistant to President Lyndon Johnson. Then, for the next thirty-eight years, with American society and popular culture undergoing a revolutionary transformation, Valenti was the public face of Hollywood in his capacity as head of the Motion Picture Association of America.Been there, done that, indeed. Texas-born and Harvard-educated, Valenti has led several lives, any one of which could have provided ample material for an unforgettable memoir. 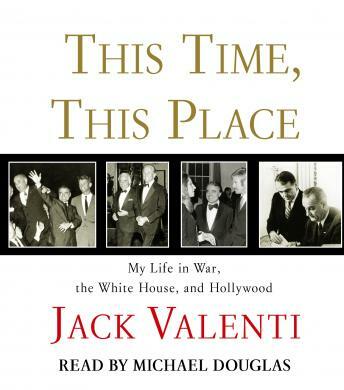 As it is, This Time, This Place is the gripping story of a man who saw the terrible face of war while fighting with skill and bravery for his country; who was in the room, listening, participating, and remembering, as political decisions were made that would benefit or devastate countless lives in this country and on the other side of the world; and who championed the interest of the vast and globally influential movie industry with tenacity and vision. The list of boldface names whom Valenti knew and with whom he worked is as varied as it is astonishing in number. Aside from LBJ, there were Jack and Bobby Kennedy, Kirk Douglas, Frank Sinatra, Robert McNamara, Jacqueline Kennedy Onassis, Julia Roberts, Cary Grant, Lew Wasserman, Catherine Zeta-Jones, Jack Nicholson, Michael Douglas, Warren Beatty, and Bill Clinton, to begin a very long list.The life of a man who earned both the Distinguished Flying Cross and his own star on the Hollywood Walk of Fame is inherently intriguing, but Valenti’s warm, sometimes rueful, always engaging account gives this memoir a depth of humanity and a taste of life’s unpredictability that will linger long after you turn the final page. From growing up poor but largely oblivious to that fact in a hardscrabble neighborhood of Greek and Italian immigrants in Houston to rising to the highest summits both of national government and Hollywood, This Time, This Place is a candid and clear-eyed reflection of the joys and sorrows, ambitions and disappointments, of a life fully recognizable in its extraordinary variety. It is also a sweeping and important historical record, written by a brilliantly successful man who helped to shape politics and entertainment in the second half of the twentieth century, and who always found himself in the center of the current storm.